Radish is a root crop, pungent or sweet in taste with a lot of juice. Radishes can be white, red, purple or black, long cylindrical or round in shape.Radish is rich in vitamin C.This vegetable can be eaten raw as salad or cooked or pickled.It is beneficial for the teeth, gums, nerves, hair and nails.Radish is a good appetizer, mouth and breathe freshener, laxative, regulates metabolism, improves blood circulation, is a good treatment for headache, acidity, constipation, nausea, obesity, sore throat, whooping cough, gastric problems, gallbladder stones, dyspepsia etc. 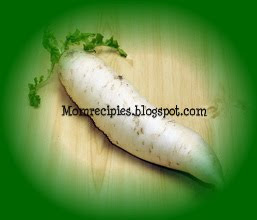 1) Wash and peel the skin of radish.Cut it into small pieces. 2) Heat oil in a non stick pan.Add cumin seeds.When it splutters,add urad dal,chana dal, red chillies.Wait until the dal get gets brown. Add finely chopped onion,fry till golden brown. 3) Add the chopped radish, mint leaves ,grated coconut ,sprinkle little water(2-5 tsps) and fry them for 7-8 minutes or till raw smell of radish goes and cooked well. 4) Turn off the stove.Allow to mixture to cool down for 5 mins. 5) Then grind the mixture with tamarind pulp,salt,turmeric and little water. 6) In a pan heat oil then add the mustard Seeds. When they splutter, add cumin seeds , bengal gram, black gram, and the curry leaves. Fry till the dals turn golden . 7) Garnish the chutney with the seasoning. 8) Chutney is ready to serve. 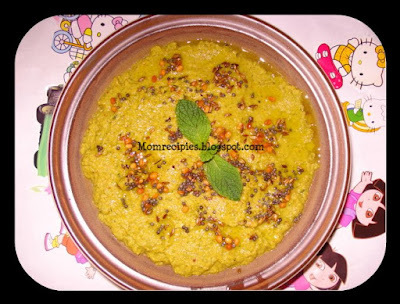 9) Goes well with Rice, Chapatis, Idlis and Dosas.